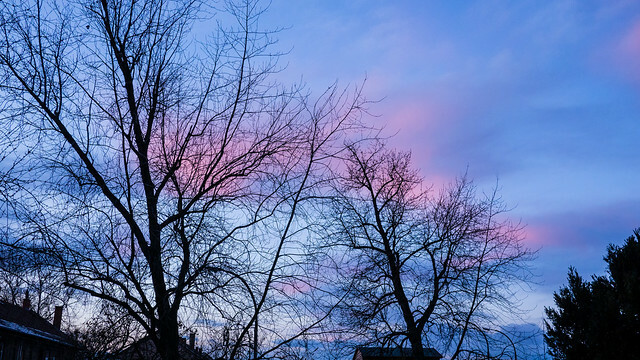 Above: As we approach February, God provides wonderful sunsets that spread the most interesting colors through the sky at dusk. After months of darkness falling upon us around 4:00, the light of the day continues to extend as we are slowly leaving winter behind. Above: Miki with his talented daughter Anna (like father like daughter). 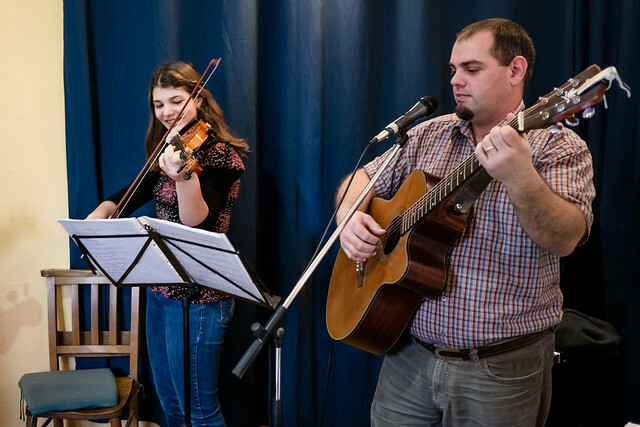 Anna did an excellent job playing violin along with our musical worship portion of service on Sunday. Although she is all smiles, she has been dealing with major health issues over the past few months. Please pray for healing for Anna. We also ask you to pray for Miki’s wife Erika (who is pregnant). She experienced early contractions and was hospitalized with some kind of infection. Please pray for healing and protection for their baby in the womb. Above: Some of our congregation’s beautiful children coming forward for prayer before going to their Sunday School classes. Above: Monika (left) helping in children’s Sunday school class. 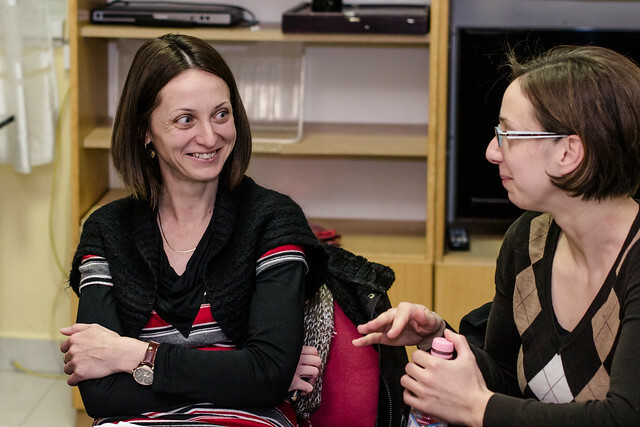 Above: Eszti is one of a number of volunteers that rotate in teaching children’s Sunday school. We praise God for seeing children (like Eszti) continue to mature in their faith and use their giftings to serve others. I can remember Eszti when she attended our VBS almost 10 years ago. She later attended one of English camps where she put her faith in Jesus Christ. She is currently in university earning a degree in education with a desire to teach. Above: Teammate Roger meets weekly with the pre-teens and also helps with our youth group ministry on Fridays. 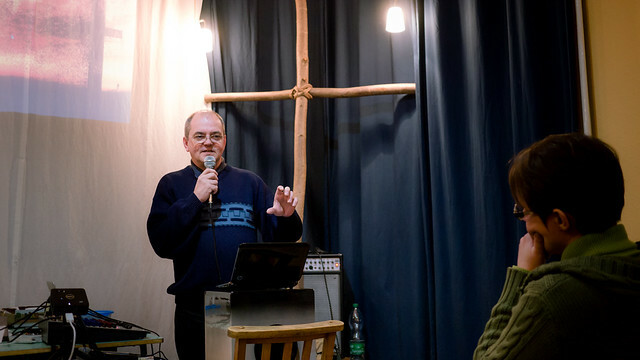 Above: Dezso preaching the congregation about the importance of the heart in prayer. The Holy Spirit has been leading our body to focus more on prayer over the past few weeks. Just last month, members from our church began working together to initiate a club for mothers with babies and young children. God also had been at work in the heart of the local florist who offered his old store location in Petofibanya to use for free as long as we cover the utilities. This store front is in a great central location and is just the right size for this ministry. Above: Timi, Edit and Jennifer talking with a young mother that attended on Tuesday. All three of these woman have a deep love for Jesus and are well known in the community. They all came to know Jesus through various ministries and outreaches of our church. We praise God that church members are growing in their faith and stepping out in the community to serve with a desire to share Jesus with others. 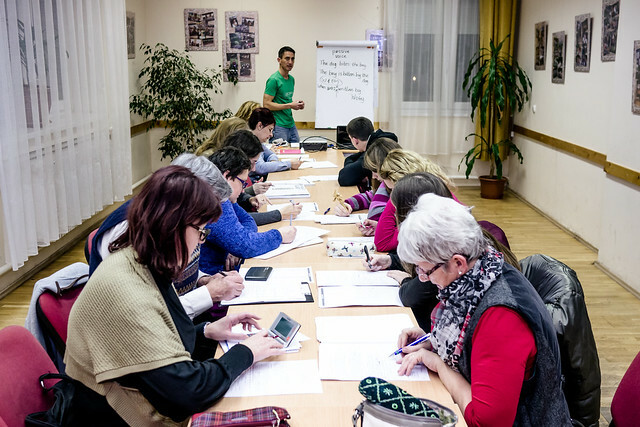 The number of those who attend English Club in Jászfényszaru continues to fluctuate because of shifting work schedules, sickness and other matters. Even with this constant change, there are those who we are meeting with weekly and God continues to open up opportunities to share the hope we have because of a personal relationship with Jesus. Above: Roger (our English mastermind) helping a beginner class in Jászfényszaru. Above: Many of our students (like this one above left) work in the local preschool and middle school. Others hold leadership positions in the community. We’re thankful for God giving us a good name in the community and for more and more relationships being developed. Above: I’m responsible for the first hour of the advanced class. Kati, one of the leaders at the community center is one of my students (center in salmon colored shirt). Kati is the one that gave us permission to hold our classes and continues to show signs of wanting to hear more about our faith. Each week, I bring random conversation questions that often lead us into serious discussion. Church members (who attend to help in evangelism) use the opportunity to give testimony in class. A few weeks ago, we asked each student to talk about their Christmas. When church member Arnold shared, he said how thankful he was to celebrate this Christmas knowing Jesus as the Savior for the first time. Last week, another discussion question asked the students to share an situation where they felt awkward. Dezso shared about a situation when he was a new believer. On his first day of work, the boss asked Dezso to organize overtime for his workers. As the day went on, Dezso forgot and only remembered while driving home when the boss called and asked, “Did you forget, or was it the workers that just didn’t want overtime?” Dezso panicked and lied saying that the workers didn’t want overtime. When he arrived home, God convicted him of his sin. He repented and was led to call his boss to confess what he had done. Awkward! Dezso thought he would most certainly lose his job, but the boss simply said, “Ok, we’ll talk about this tomorrow.” Later in the day, the boss spoke to Dezso in private telling him that now he was sure he chose the right person for the job. I praise God for these testimonies naturally coming out in class and surely planting seeds in the students hearts. Please pray for wisdom as we are planning a Bible study for students in the near future. Pray that students would have a deep curiosity and hunger to know more about Jesus. Above: A young mother (extended family of Vincse where we hold our study) joins us for the first time in Apc in our Friday night Bible study. As is all too typical with many Romani we encounter, this mother’s story has her husband in prison while she is at home with four children. We were able to share the good news of the Gospel with her and she seems close to making a decision. Please pray that her eyes would be opened and that she would respond by believing in Jesus as Lord and Savior. 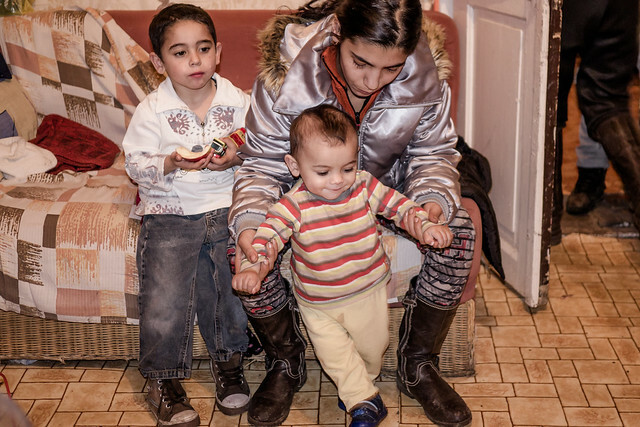 We continue to travel (a bit over 100 kilometers) to the town of Bogács each week to minister to another Romani family that has opened their home to us. Puljka, the father of the household has since become a believer and is praying for his wife Katyus to come to faith. Around three weeks ago, Katyus shared again about oppression she was feeling when wanting to pray to God. She also shared about being overcome with fear and a sense of doom. We spent some time praying for her before we left that night trusting that Jesus could set her free. The next week Katyus shared that she really didn’t feel anything when we prayed, but that night she had a dream. She said that in her dream three men appeared in long robes. One of them approached her and laid his hand upon her head. She said she just felt peace. Katyus continued to share that he took her to the spot where I baptized her husband Pujka and he baptized her. She said that after that dream she felt free the entire week from the oppression she had previously experienced. The following week, Puljka and Katyus had a marital conflict that they were working through which disrupted our Bible study. By God’s grace, even in the midst of the tension, and outbursts and emotion, I was able to share with both of them how they could work through the matter. I told Katyus that no matter how much she accused and sought to control her husband in order to keep him from doing wrong, she was powerless to change him. The only one who has power to change the heart is God. I encouraged her to pray and to trust God with her husband’s heart. I said that her husband would be much more likely to respond to the Holy Spirit correcting him than her correcting him. She just kept nodding her head and said, “I understand.” Now, just last week, I was pleased to see Katyus smiling when I walked in. She said, “Allen, you wouldn’t believe it, but I took your advice and we are doing much better!” Praise God for every baby step, every movement toward living according to His truth. We also had a new visitor in Bogács this week. Edit, along with her daughter Kati attended after multiple invitations from Katyus (who ironically still is not a believer). Edit is familiar with the Bible, but unfortunately has been influenced by the teaching of a sect that operates in that area. It seemed as if she got the point of what I wanted to share after our study: Filter all teaching through the Bible. Test to see if what people are saying is biblical. She requested a Bible for next week and we hope that she returns. It is important to note that the person that is frequenting Edit with false teaching once visited Puljka and Katyus on a regular basis. But as we studied the word together, first doing an overview and now systematically going through the book of John, Pujlka can more clearly identify false teaching. Last year Pujlka told this person no longer to visit his home. Pray that this sect would not deceive any more people in Bogács and that Jesus would reveal Himself and His message clearly to Edit. 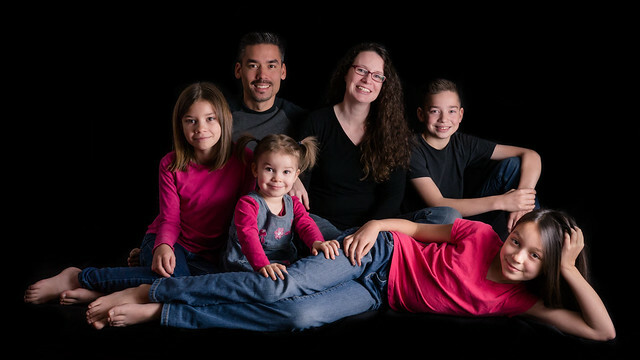 With BVBC’s generous help, our family will be back in the US for a mini-furlough from early February through the first week of March. We’ll be participating in BVBC’s various mission events from February 22 to March 1st. We’ll also be guests at Bible Fellowship Church of Newark Sunday February 15th. 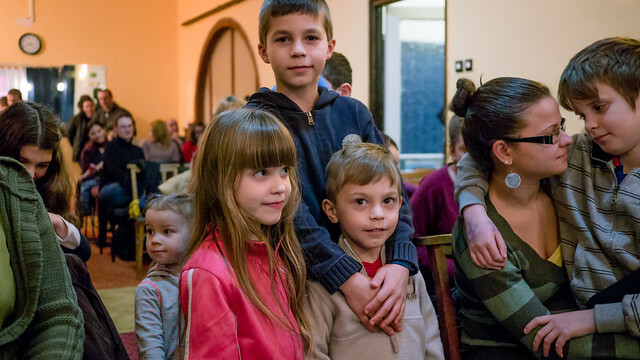 We look forward to seeing many of you face to face and sharing how God has been at work in Hungary.